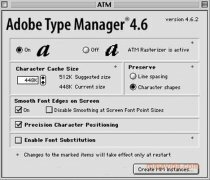 Adobe Type Manager is an application that will make it easier to work with the PostScript and OpenType fonts. These fonts for digital typography professionals, are scalable and don't lose resolution when they change size. With this software by Adobe we can view these fonts with great quality, as well as being able to scale them and activate the font smoothing to improve what they look like. 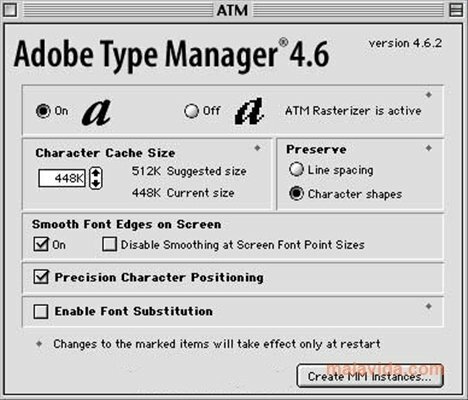 This application, also known as ATM, allows us to carry out various changes on these kinds of typography fonts. We will be able to modify some of the fonts' features to our own liking, change the size and perform other changes. 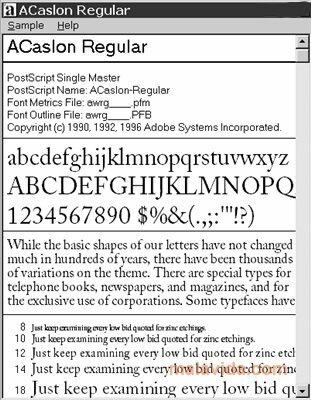 With Adobe Type Manager we can also print these fonts on printers that aren't PostScript, and create customized instances for specific fonts. If you work in the design world, or you're simply interested in typography, Adobe Type Manager will help you to manage and adapt the fonts to your own tastes and needs, with high quality results. This download requires a compatible compressor.